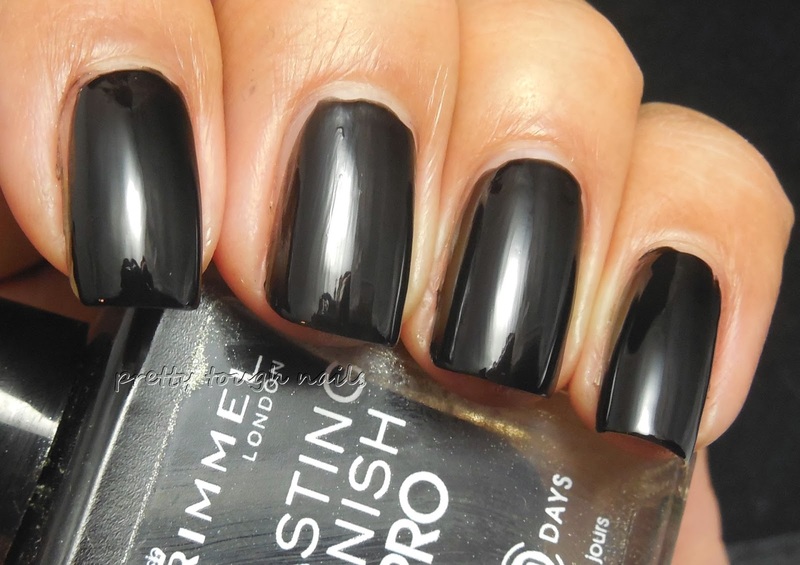 I'm still going strong with Halloween themed manis and today's mani starts with Rimmel Lasting Finish Pro Black Satin. I don't think I've ever tried this line of polish before and I have to admit I was skeptical, especially with a black polish as my introduction. I anticipated some streaking and patchiness, but fortunately I did not experience either. I used two coats here and got complete coverage. The brush was my only difficulty in that it was a super wide brush. My skinny nails no likey that. I was impressed at the super glossy finish once it dried. No topcoat here. 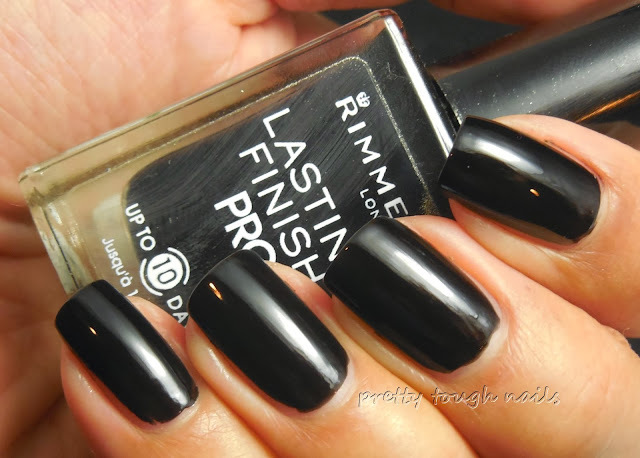 Currently, via Nouveau Cheap, this line may be phasing out of the Rimmel collection so grab them quick! I know they're marked down at Walgreens currently. Next to give it some bling, I added a layer of L'Oréal The Bigger The Better a black jelly base with silver microglitter. I'm not sure if this was a limited edition or part of the core line. I used two coats here and it dried slightly gritty and matte. I used a thick layer of topcoat to add shine. Remember how I loved the googly eyes in my mummy watermarble? 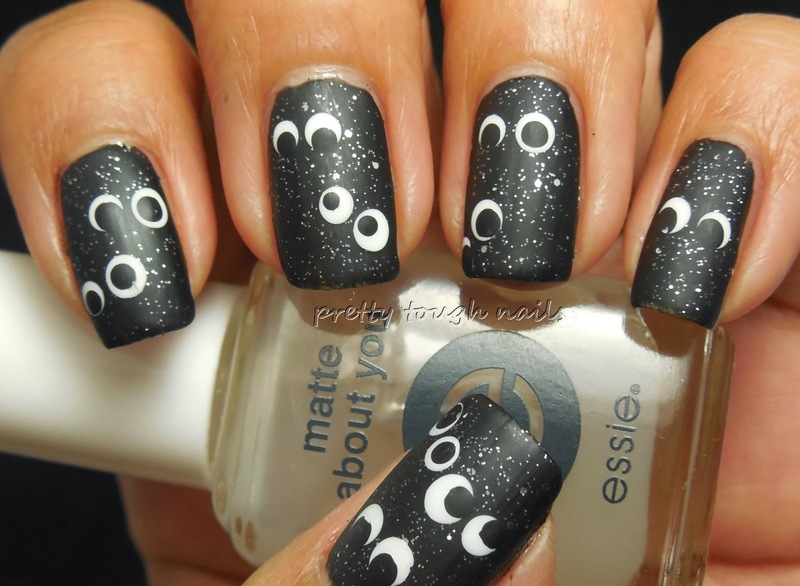 Well I decided to try them again with an eyes in the dark themed mani. I think I may have gone a little overboard with them. 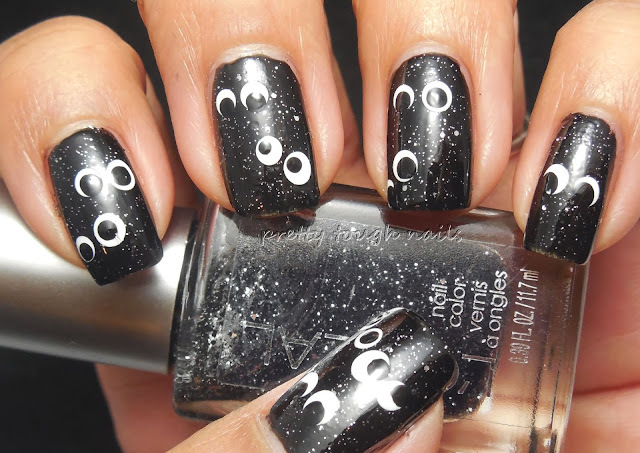 I did them with topcoat and then later applied a layer of Essie Matte About You. I still think the eyes are cute despite being a crowd of whatever they are in the night. I'm not sure if they're little creatures with sharp little teeth or cute little fluffy bunnies. Just remember, they're watching you!! Cuteness! I am loving your Halloween nail art! Re Rimmel Lasting Finish -- if you see it in Rags to Riches grab it, that one's a really great green. Crap, I had it but I think it broke in transit to me. Boo. Aw, this is really cute! I love the eyes.